It’s a while since the Festival of Life and Death events happened on/around weekend of 8th September 2018. The recovery from the emotional/energy investment is quite a big factor; besides which the many people who’ve helped make FoLaD happen to date are very busy doing their own day-jobs, which are typically very intense and demanding anyway. And so the first report has taken a while, and might yet be edited/augmented a bit. Meanwhile if you’d like a copy of the report as it stands please email and ask for one and we’ll send it to you. Thanks to everyone who helped and participated, and engaged/supported via social media, etc. What we’ve all achieved so far in such a short time is extraordinary, and is a very significant platform for substantial growth/innovation, increasing connections, and dramatic effects for the coming year, and beyond. Enjoy the year-end festivities and new year. Thanks and love to all. The extraordinary artist Emma Fay brings her Enter Edem theatre company‘s Un Dia experience to Leicester’s Festival of Life and Death event at Haymarket Theatre on 8th September 2018. Emma uses radically beautiful art and theatre to educate and change minds about challenges of modern times – to improve life and humanity, health, environment, etc. Un Dia will be performed within the Studio Theatre, next to the main Hobgoblin Foyer stage area, featuring performers and speakers including David Parkin, Daryl Kirkland, Refuge, and Freddie Ferrier. The Un Dia experience will be continuous so that visitors can join/leave any time during the 2-5pm FoLaD event. 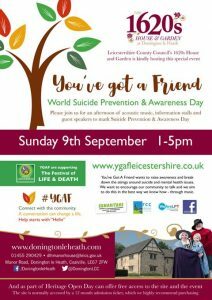 The Festival of Life and Death is a global movement for suicide education and prevention. The Haymarket Theatre FoLaD is the founding event. Emma Fay’s Un Dia is a wonderful addition to activities. Thank you Emma and team. The Festival of Life and Death and Un Dia are free to attend. Emma’s remarkable work has featured in campaigns for Macmillan Cancer Support, PETA, UN-Water, Born Free Foundation, Rethinkyourmind and World Toilet Day, and UK Shark Week featuring body art ‘models’ Tom Daley, Joss Stone, and members of the 2016 British Summer Olympics team. 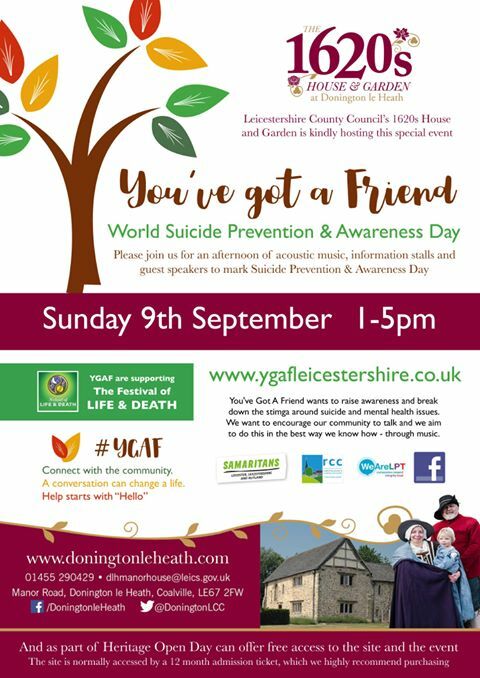 An afternoon You’ve got a Friend festival – 1-5pm 9th Sept – of great music, people, surroundings, with wellness and suicide prevention information/stalls. Hosted at Leicestershire County Council’s 1620’s House and Garden, Doningon le Heath Coalville, Leics. Thank you all at #YGAF for supporting The Festival of Life and Death. Best selling author Kelly Walsh is seeking stories globally on ’emerging proud from suicide’ for a new book about hope and transformation after suicidal experience. Here is Kelly’s pdf for the project – ‘Kinda Proud’ Stories of Hope & Transformation.